Our shield designed and created by pupils represents all four Houses and contains a word chosen by each House group that reflects their House Motto. Arngask Primary and Nursery School is situated in the village of Glenfarg. The school is made up of two buildings, the main school building and the Early Years Building. The main building dates from 1871. The Early Years building, built in 2002 is home to our Nursery and P1/2 class. There is a large playground containing a soft-bark play area with climbing frames, a small wild flower garden, an orchard and a grassed football pitch. All of which are used for play and learning. The catchment area for Arngask Primary School is as follows: the most northern point reaches Glenearn Hill, Most Southern point is Birniehill, furthest Western point is Baulk Hill and Eastern is Leden Urquhart. 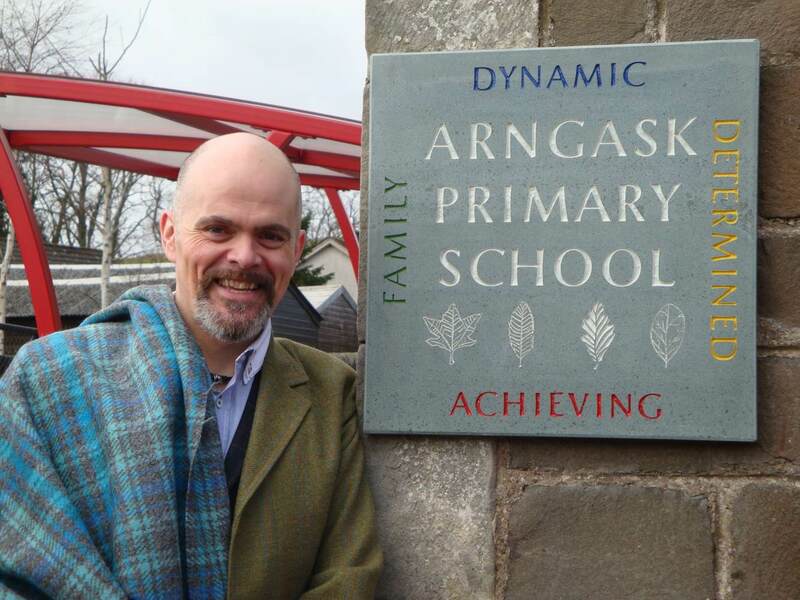 Arngask Primary School became part of the Kinross High School cluster in December 2012. Kevin Macleod, local writer/singer/performer with FunBox unveiled our school sign with Ms Forbes who made it. The signs shows the four words which sit with our vision. Each word represents our House Mottos. our vision is to be the best we can be.